Certainly looks a bit more worn than before and the roof tiles are now the appropriate colour. To be frank, the picture makes it look brighter than it actually is. The same applies to the tree in the churchyard, which was originally undercoated black and has had various shades and washes applied to it, but now looks a bit ‘spectral’ – although it is darker to the natural eye. I still need to finish off the remainder of the churchyard and add a few details to the church doors, but when you progress a large terrain piece from ‘half-done’ to ‘almost done’, you do have a sense of achievement, as large terrain pieces do take a fair while to paint compared to figures. Next up – Something New. As my last post did state that the churchyard was where Lord Edmund Blackadder’s time machine had ended up, I thought I’d best show it in place – as I’ve finally got around to finishing the bloody thing! Trying to create tiny clock hands out of very thin plastic that were the right shape AND symmetrical proved quite tricky. Also discovering that I really should have made the trench surrounding the dial slightly wider to allow me to write the numbers around the dial more clearly was an annoyance, but it IS finished now, so I’m quite pleased. And yes, this close-up of the time machine revealed that I’d missed painting one of the chapel’s buttresses, which is why it still has the warm toffee colour of the original paint job. Now, we’ve got Blackadder’s time machine complete, but where is the man himself? He is our Something Borrowed. 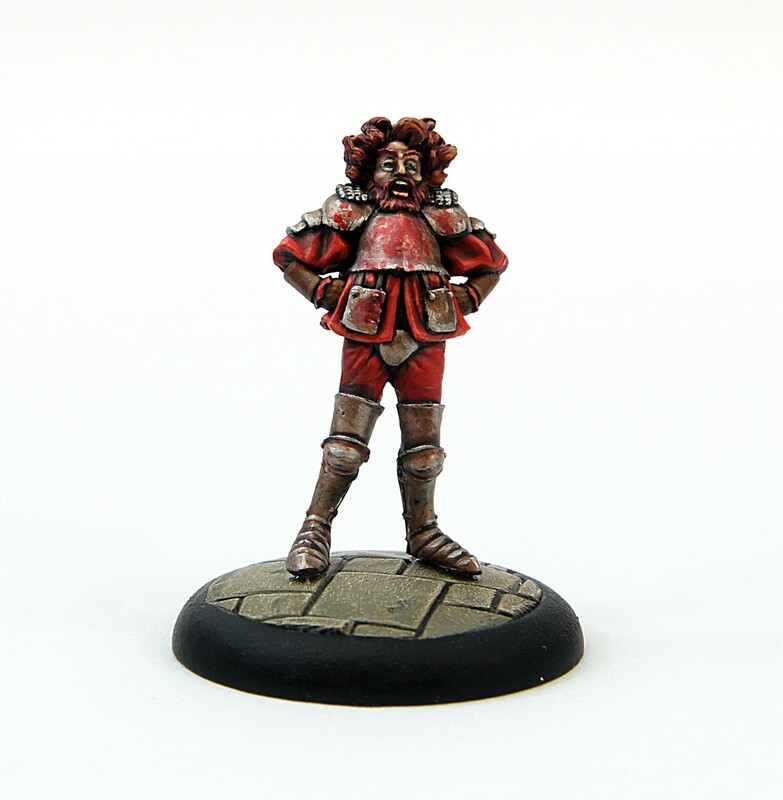 So, I finally managed to get the figure I’m using for my version of the 1999 incarnation of Lord Edmund Blackadder based, undercoated and some paint on him. Strangely, the bit that took the longest was mixing up the colour for his velvet jacket, as I did not have a suitable colour pre-mixed – Imperial Purple being too pink and Worm Purple being too purple. So, “Blackadder Plum” was tinkered with until it matched what I thought the colour should be. Still a bit of work to go, but he’s coming along and at least he can now appear in physical form for his adventures in Blackwell. So, something old (the church), something new (the time machine), something borrowed (Edmund Balckadder), which leaves…something blue. Or in my case, something orange…Zygons! I took advantage of Black Tree’s post-Christmas sale to add some classic characters to my Doctor Who collection, including a couple of the classic Zygons from the 1975 Fourth Doctor serial Terror of the Zygons. Now, I know that the modern re-design of this alien race has changed their colouration slightly, so that they look more crab-like in colour, but my recollection and online images from the original story, showed they were a greeny-orange colour, so that’s what I went with. Both figures were given an undercoat of white, followed by a coat of GW Bogey Green, and then a coat of my ‘Pumpkin Orange’ mix. And that’s it. Hopefully, this post signifies a return to more regular posting. The next post will be my regular post-Salute report, as it’s now less than a week away, and will be from an ‘insider’s’ point of view, as I’m helping out on the Wargames Terrain Workshop stall and demonstration tables this year. So, please feel free to drop by and say hello. Time travel is a tricky prospect. Your first issue is discovering a means to propel your physical form through the space/time continuum in a safe and controlled fashion. Whether you utilise a limited edition American sports car, an antique call box or a map allegedly left over from when the Creator was building the Universe matters not – you still have to possess the item. Your second issue (and this is the biggie) is whether your actions in the past will effect the future. If you meddle with a past timeline, when you return to your starting point, will the World you encounter be the same as when you left? Will the inadvertent loss of a cigarette lighter in the distant past have caused an earlier technological revolution, resulting in you previous ‘present’ being reduced to a radioactive cinder? Will the wrong thing said at the Nuremberg Rallies have changed the outcome of the Second World War, with the majority of Europe now occupied by the Nazis? Will the Earth have been invaded by super-intelligent Koala-like aliens, who have subjugated the population and forced them to mass-produce soft toilet tissue? These are all things that the intelligent and responsible time traveller must take into account when venturing into the past, as even the most subtle of changes could have wide-reaching and devastating consequences. However, if you have a Plan and a goal, if you know exactly what result you wish to achieve, then maybe, just maybe, you can carefully tweak the past to improve your own future. With a slightly disappointing displacement of air, a canvass and wood contraption, looking like a carriage clock writ large, appeared suddenly, then dropped to the ground. As the booth-like object settled into the damp earth of the churchyard, there came from within the sound of someone falling over, followed by what appeared to be a toilet flushing. Lord Edmund Blackadder closed the heavy tome he had balanced on his knee and looked askance at the crumpled heap of his manservant, who had endeavoured to prevent his fall by grabbing the toilet chain. “Yes, my Lord…sorry, my Lord.” Said Baldrick, clambering to his feet. “Er…I don’t understand, my Lord.” Stammered Baldrick. Blackadder released the cord holding the door and lowered the gangplank. “But…it might be dangerous, my Lord…” said Baldrick fearfully. The Greatest Breakthrough in Travel..
As I am now the proud owner of the surrogate figure I’m planning on using to represent Lord Edmund Blackadder (circa 1999), in order for him to visit the London borough of Blackwell, I decided that some additional work was needed to complete his time machine. The initial box was crafted from an Amazon cardboard ‘envelope’, with a circular hole cut in the front and the drawbridge-like door cut into the left side. A smaller disc of card was then covered in baking foil (dull side up) to create the clockface, then glued to a larger disc of card and fixed behind the hole, giving a bit of depth to the model. All four sides and the top were then given a covering of textured wallpaper, to represent the canvass sides of the machine. A rubber washer, topped with a smaller plastic washer and then a plastic cap were glued together and added to the top of the device, to represent the viewing port of the original machine. I also decided to add several cut down cotton-bud stems to represent the frame that the canvass is attached to. It’s not exactly the same as the original design, but it’s a pretty good match and I’m happy with it. Now, as it was fairly evident that it was cobbled together from a variety of disparate parts, I decided to give it an undercoat of Docrafts Linen, in order to blend them all together. The exerior requires dry-brushing with a dark pink, the ramp needs a coat of brown and I need to add the numerals, decorative marks and hands to the clockface, but it’s progressing well and should be finished…in good time. 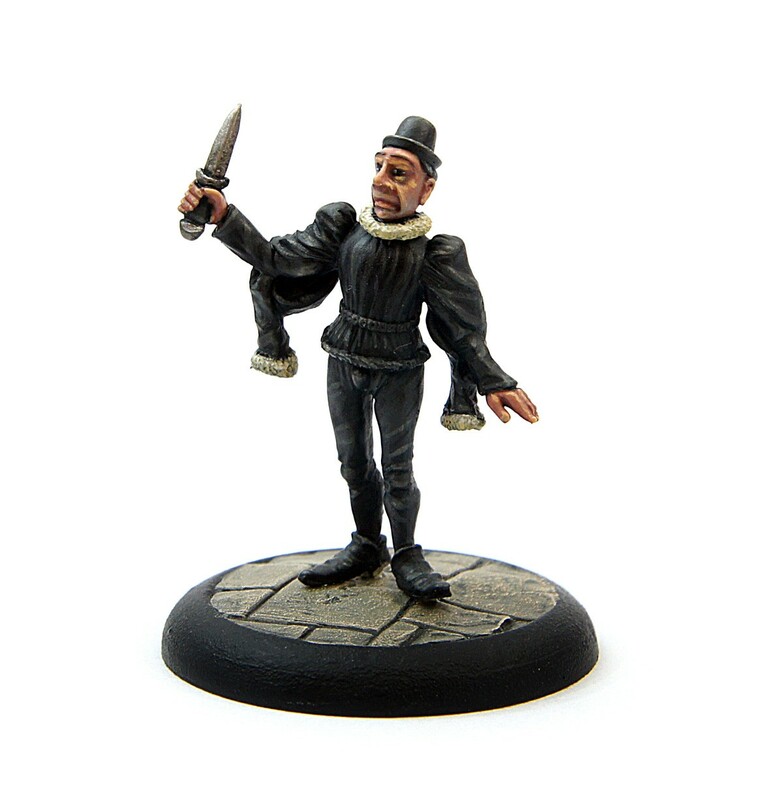 I just need to base and paint Blackadder himself and he will then be meddling in the affairs of the residents of Blackwell. Regular visitors to the Buffet will know that I’m a big fan of the BBC comedy series Blackadder, which ran for four series between 1983 and 1989, with a couple of specials broadcast in 1988 and the final instalment of the saga – Blackadder: Back and Forth – released in 1999. During this time, we were introduced to NINE incarnations of the titular character, from Centurion Blaccadicus, way back in Roman occupied Britain, to the most recent Lord Edmund Blackadder, who through some unscrupulous tinkering with the time-stream, managed to end up as the King of England. Now, you might be wondering what this possibly has to do with wargaming? 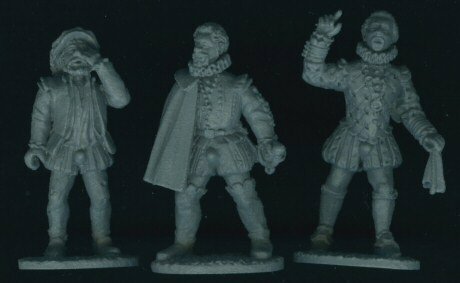 Well, it would appear that I’m not the only fan of the Blackadder series, as various companies have produced 28mm versions of Edmund and his chums. at £3.75 each, from their “Sword” range. At £7.20 for all three, that’s £2.40 a figure, which is pretty good value. Lieutenant George, Private “Bob” Parkhurst, Captain Darling, the drinks cabinet, General Melchett, Captain Blackadder and Private Baldrick, all for £8.20. Unfortunately, this is the best picture I could get from their website, but if you want to see them painted extremely well and in a suitable diorama, then pay Michael Awdry’s 28mm Victorian Warfare blog a visit, particularly this post, to see what they should look like. Now, whilst we have three incarnations of Edmund, this still leaves us short of Centurion Blaccadicus; Sir Edmund Blackadder from the English Civil War; Mr E. Blackadder Esq., butler to the Prince Regent; Mr Ebenezer Blackadder, proprietor of the finest moustache shop in Victorian London, Lord Edmund Blackadder, time-travelling ne’er-do-well and Grand Admiral Blackadder of the Dark Segment. And believe me, I have trawled the Internet, looking at various ranges to try to find suitable proxies, so I could have the ‘full set’ without luck. Now, I’d put the idea of ‘The Blackadder Project’ on hold back in 2014, but with my current focus on all things Victorian, I thought it would be quite amusing to add the Victorian incarnation of Blackadder to the narrative. After an exhaustive search of the Internet, I still haven’t located a suitable figure to represent Mr Ebenezer Blackadder. Not giving up on this idea, I changed tack and started searching for a suitable figure for the modern version, as whilst I would have to build a time machine, this shouldn’t present a problem. Strangely, finding a suitable figure for an unarmed, bearded man in a suit in 28mm isn’t quite as easy as you’d think. I did consider Tony Stark from the Heroclix Avengers Movie subset, but the amount that this was going for online was silly for a single plastic figure. Just before I go, it seems that my regular posts on the Buffet have inspired a fellow gamer to take a crack at this blogging lark. His name is Harry and his blog is War Across the Ages. So far, he has provided a very interesting introduction into how he got into the hobby, which should ring a few bells with the majority of you out there. Why not pay him a visit and see what he has to say. Next time…we shall be returning to Blackwell to see what’s been occurring.